When East is West: Two Trains at the Junction. 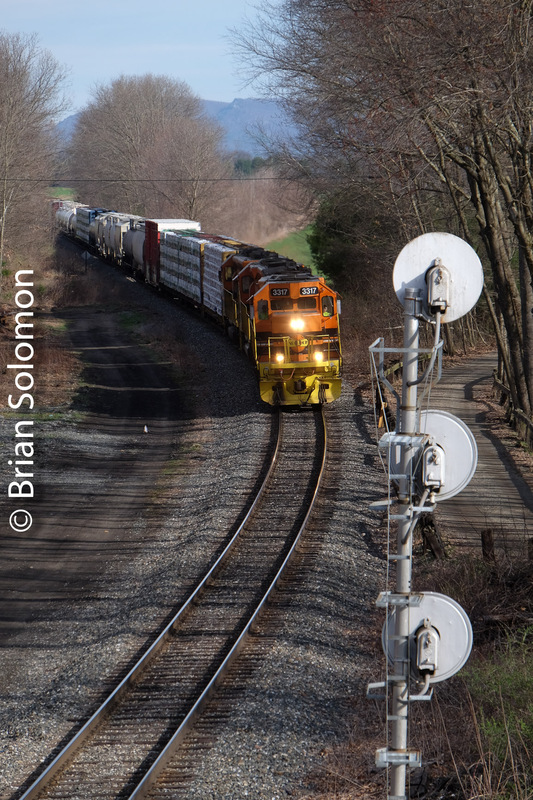 I’ve been making photos at the Junction at East Northfield since the 1980s. 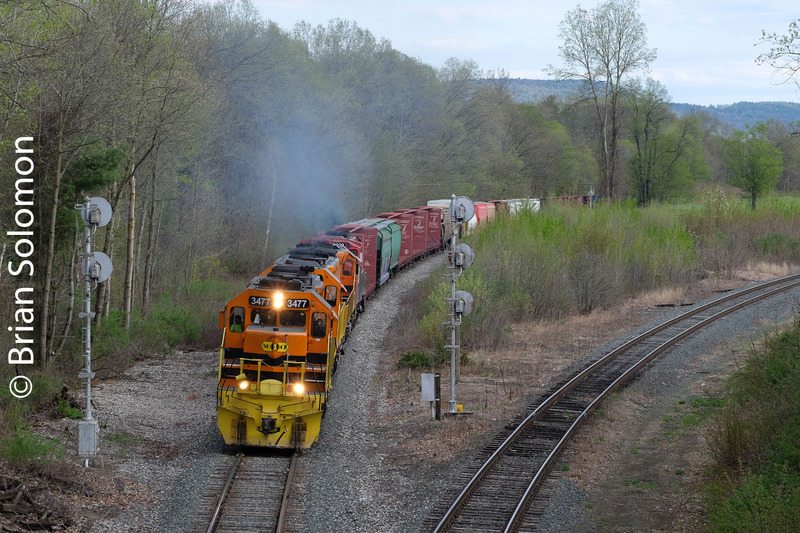 The other day, on the third visit in two weeks to this iconic New England location (where New England Central’s line connects with Pan Am Railway’s Conn River route), I had a reckoning. It occurred to me that railroad timetable ‘East Northfield’ is actually north and west of the town of Northfield, Massachusetts. 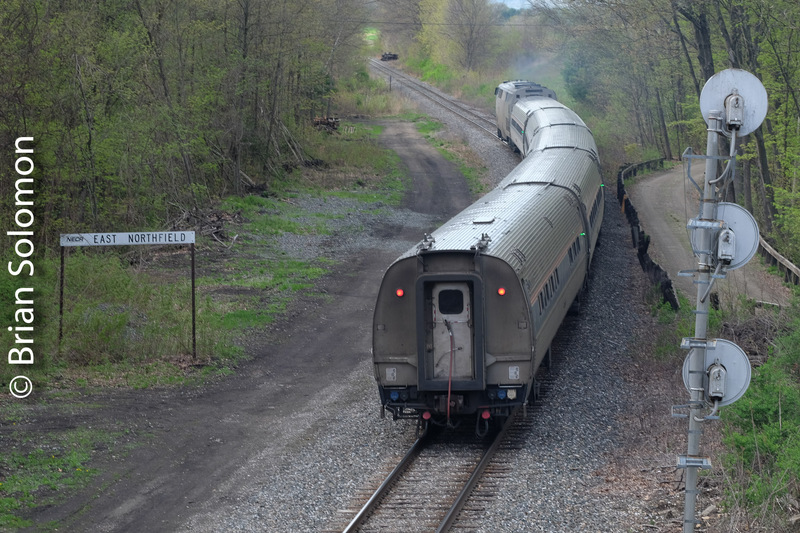 Some Highway maps show railroad ‘East Northfield’ in West Northfield. This timetable location has been called ‘East Northfield’ since the steam era, and the present NECR sign reflects this historic geographic incongruity. 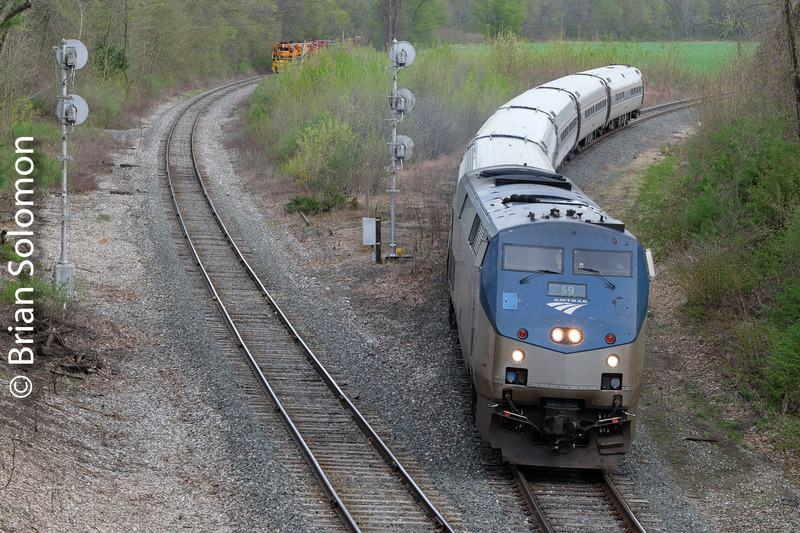 Amtrak 56 accelerates away from the junction at East Northfield, clearly identified by the New England Central sign at left. Back in the old days, there was a railroad station on the right side of the tracks, and that was the ‘East Northfield Station’. 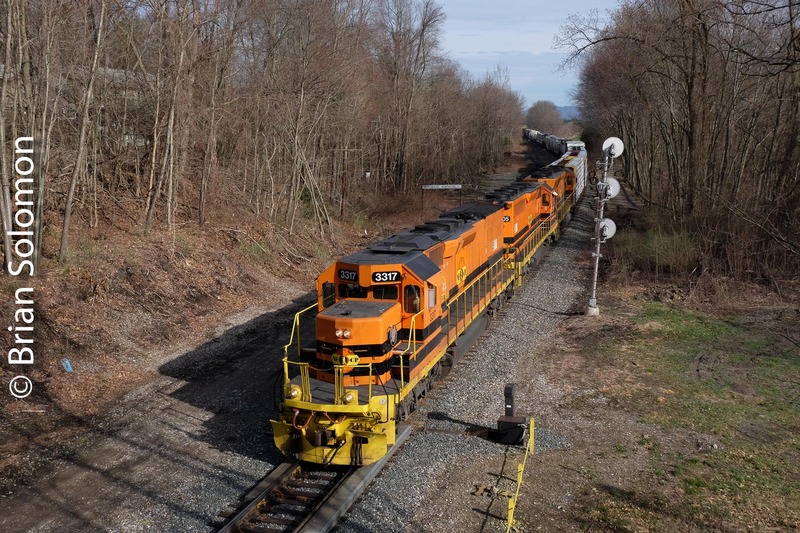 After Amtrak 56 completed its station stop at Brattleboro and cleared railroad location at West River, NECR’s dispatcher gave northward freight 611 permission to proceed. Exposed using a FujiFilm X-T1 with 90mm lens. No doubt at some point in the future, the geography will be retro-actively re-written to accommodate this oversight on the part of historic railroad timetable writers. What will they make of my captions! November 1st is celebrated as The Day of the Dead in Mexico, and as All Souls Day in some European traditions. For the Celts it is Samhain. 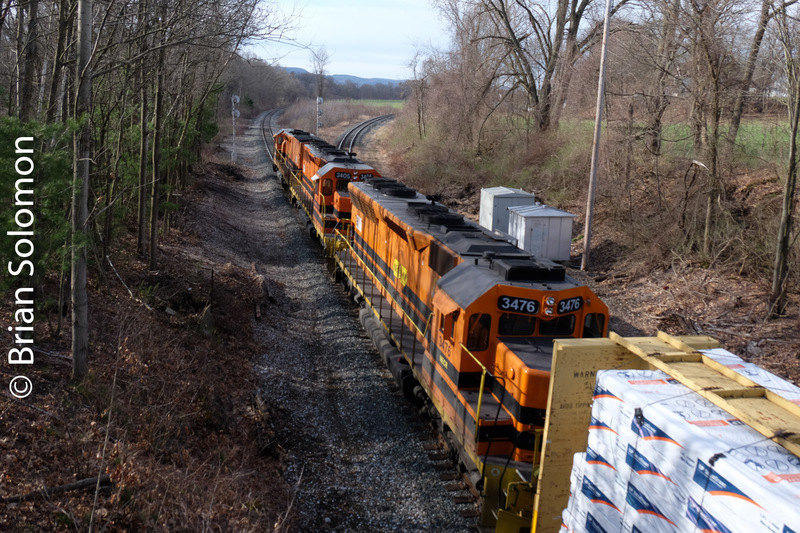 In honor of these holidays, I present a pair of recent views of Pan Am Railways symbol freight EDBF (East Deerfield to Bellows Falls, Vermont) passing a grave yard near the Boston & Maine Connecticut River Line at East Northfield, Massachusetts. Low sun accentuates autumn foliage and allows for a glint effect on the side of the locomotives while making for stark silhouettes of some of the grave markers. I exposed these views with my FujiFilm X-T1. In post processing I adjusted the camera RAW files in Lightroom to balance the contrast and warm up the color temperature. In addition to the digital photos, I exposed a few color slides using my Canon Eos 3 with a 20mm lens..
Tracking the Light posts daily, don’t miss out!